Pastor Chuck Baldwin covers the U.S. Supreme Court’s denial of certiorari in Hedges case, and our amicus brief. Bob Unruh’s article discusses the tragedy of the U.S. Supreme Court denial of Chris Hedges’ petition for certiorari challenging the constitutionality of National Defense Authorization Act of 2012. NDAA 2012 allows the U.S. military to arrest and detain, without charges, counsel, or trial, anyone thought by the government to be a threat based on vague standards. Pastor Chuck Baldwin discusses our brief in the Hedges challenge to military arrests under the National Defense Authorization Act. Bob Unruh’s article “Congress Grants Obama ‘Free Rein for Martial Law'” discusses our brief in the Chris Hedges challenge to the National Defense Authorization Act. This morning, the American Thinker published an article by Herb Titus and Bill Olson refuting the President’s claims of authority to kill American citizens off the battlefield. Our article is a legal rebuttal of the U.S. Department of Justice’s White Paper purporting to defend President Obama’s position. Today we filed a Petition for Reconsideration in the case of Michael G. New v. United States in the United States Court of Appeals for the Armed Forces. On July 16, 2012, we filed Petitioner’s Reply to Respondent’s Answer to Petitioner’s Writ-Appeal Petition for Review of Army Court of Criminal Appeals Deceision on Application for Extraordinary Relief in the Form of a Writ of Error Coram Nobis in the United States Court of Appeals for the Armed Forces. Herb Titus was quoted in the WND.com article “Judge to Feds on Citizen Detention: I Said No!” by Bob Unruh regarding the case of Christopher Hedges v. Barack Obama, et al., in which we filed an amicus brief. The WND.com article “U.S. Soldiers Forced To Wear U.N. Logo?” by Bob Unruh discusses our Petition for a Writ of Coram Nobis in the case ofMichael G. New v. United States. The Michael New case is back. 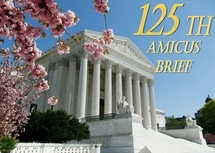 Our amicus brief in Christopher Hedges v. Barack Obama, et al. was discussed by Courthouse News Service in the article “NDAA Opponents Stretch Across the Aisle” by Adam Klasfeld. Herb Titus wrote a memorandum for Delegate Bob Marshall on H.B. 1160 — A bill to Prevent Virginia from Aiding the U.S. Military in the Detention of Virginians under the National Defense Authorization Act of 2012. The memorandum discusses the interplay between Virginia H.B. 1160 and the federal law that it addresses, the National Defense Authorization Act of 2012. The San Diego Union-Tribune article “Tea Party Marine sues to stop dismissal” by Gretel C. Kovach discusses our complaint in the case ofSergeant Gary A. Stein v. Colonel C.S. Dowling, et al.